Integrity Research received a strong response to our fourth comprehensive research pricing survey with over 140 firms, including investment banks and independents, providing information on their research pricing practices. The survey was conducted in August and September 2018 and included respondents from 24 countries in Asia Pacific, EMEA and the Americas. The 70-page study has been revamped to focus on pricing benchmarks derived from the survey results. The analysis segregates pricing trends for investment banks versus independents, by quartile, comparing fees charged for subscriptions, events and analyst access to overall research payments. The study provides payment data for eleven different varieties of investment research from macro to fundamental to alternative data, as well as the typical subscription fees associated with each variety of research. The study benchmarks are timely in light of increasing pressure from European regulators for increased transparency of research fees. For this reason, the survey results are relevant for asset managers seeking to benchmark bundled research, in addition to research providers examining their own pricing strategies. Integrity’s most recent Research Pricing Survey was conducted from August 23, 2018 through September 30, 2018 through an anonymous online survey. Participation was invitation only, directed to providers of institutional investment research. In total, 141 firms participated in the survey. U.S.-based survey participants represented 55% of respondents, European research providers represented 28%, of which 17% were based in the U.K. 9% were based in Asia. Analyst access and written research were the most common research products offered by respondents. The median respondent offered seven research products. We estimated that fundamental research was the main research methodology for just over half of the respondents, while macro research was the primary offering for nearly a quarter of respondents. 36% of the respondents were sector specialists. The study extensively examines average, maximum and minimum payments to research providers, as well as differentiating fees across a variety of metrics. The analysis segments payment metrics in various ways, disaggregating investment bank payments from independents and tiering the payments. Payment data associated with differing research product types is used to assess payments by product type. Because many independent research providers specialize in specific research methodologies or products (such as expert networks or alternative data providers) the survey provided opportunities to parse payment data by methodology and product. Respondents were asked to describe their fee structures, their average research payments received from buy side clients, maximum fees received from a buy side client and minimum fees from a buy side client. 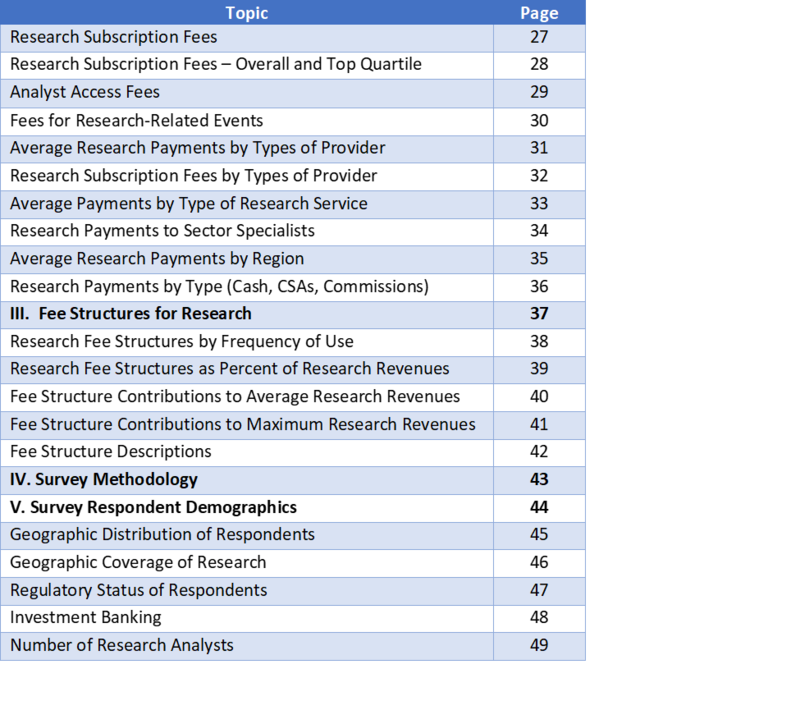 The survey requested minimum and maximum fees for subscriptions (usually applied to written research), analyst access and events. In addition, they were asked to provide a per sector fee if they charged by industry sector and a geographic fee if they charged by geography. We estimated 36% of the respondents were sector specialists and 27% were geographic specialists, supplementing the data provided by research providers that charged sector fees or geographic fees. We segmented fees by the type of research offered, including fundamental research, economic research and primary research, as well as more specialized offerings such as technical analysis, quantitative analysis, policy research, short ideas, industry-level research and alternative data. The study also estimated payments by region and average payments by research service, such as financial models or custom surveys. Participants were asked to describe their fee structures. The survey also included questions about the types of fee structures used and their contribution to buy-side client revenues. Respondents also explained the research services associated with their minimum and maximum research payments. We analyzed the variety of fee structures being used by survey respondents which range from subscription pricing to price taking, including consulting fees, menu pricing, project pricing and variable fees for high touch services. In most cases, research firms used more than one fee structure. We examined the impact of fee structures on revenues and which structures generated higher or lower fees. By cross-referencing average client revenues and maximum client revenues to the estimates of fee structure contributions to revenue provided by the survey respondents, we derived dollar amounts associated with each fee structure covered. 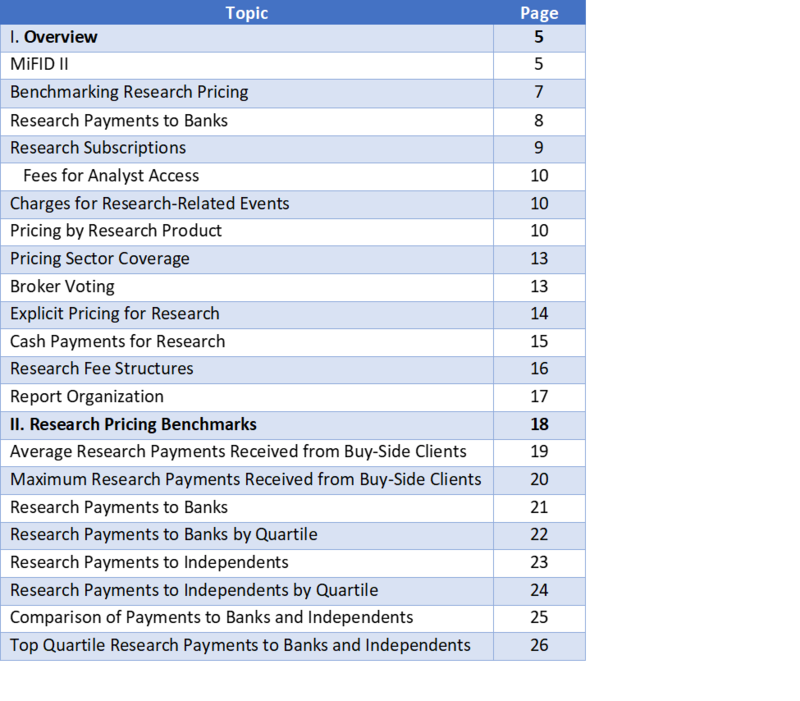 Summary: Data and analysis on research pricing for investment banks and independents, by quartile, comparing fees charged for subscriptions, events and analyst access to overall research payments. Analysis of minimum, average and maximum research-related payments across types of research providers, research methodology, sectors, among other metrics. Analysis of fee structures across providers.